Fish will fly when Port Lincoln hosts its Tunarama Festival this weekend, with the town’s population expect to more than double as around 20,000 visitors head to the Eyre Peninsula for the iconic event. In its 58th year, the four-day festival across the Australia Day long weekend is headlined by the tuna toss competition, which attracts entrants from around Australia and the world. The event requires competitors to hurl a 10kg tuna with a rope handle as far as possible. Salmon toss and prawn toss competitions are also held for younger competitors. The record tuna toss of 37.23m for men was set in 1998 by former Australian Olympic hammer thrower Sean Carlin. The women’s record is 21.25m. 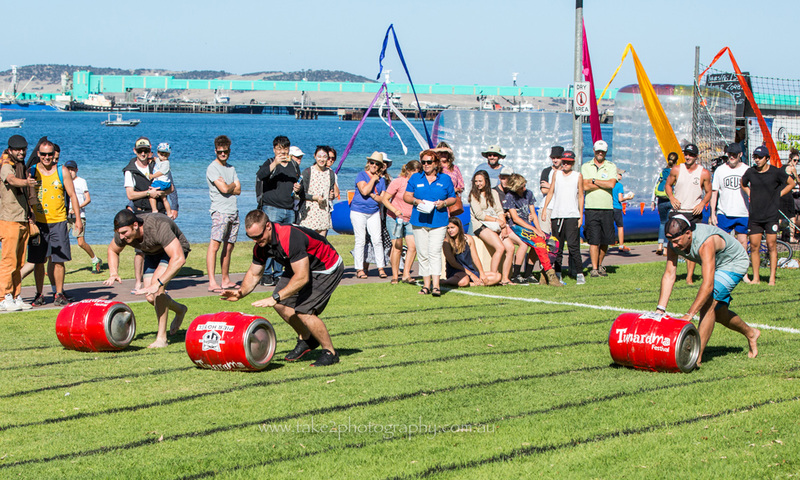 In contrast to the now-axed octopus toss at Port MacDonnell’s Bay Escape Festival, which began because of the annoyance octopuses caused that region’s rock lobster fishermen, the tuna toss was introduced in 1979 to celebrate Port Lincoln’s tuna industry. A rubber tuna is used for the bulk of the competition but a real tuna, albeit an inedible one that was dead when it was caught, is used for the final. “They derived the tuna toss from when the guys used to bring the boats in and they would stand on the deck of the tuna boats and throw the fish down to the truck,” says Tunarama president Sharon Humenick. “We’ve got people who fill up wheat bags to the same weight and practice half the year and we get some really big guys who come over thinking they are going to break the record but no one has ever got anywhere near it. Port Lincoln is the home of Australia’s largest commercial fishing fleet and the $120-million-a-year southern bluefin tuna industry, with the Spencer Gulf also supporting premium oyster, prawn, kingfish and abalone industries. The Tunarama Festival has a distinctly Aussie flavour and features beer keg rolling races, prawn-peeling and watermelon-eating competitions, a slippery pole climb and a boat building competition where two-person teams are allocated two hours to build a boat from plywood and then race them in Boston Bay in the afternoon. On the more serious side, a blessing of the fleet ceremony is held along with gourmet seafood dinners and an Ambassador Quest where participants raise money for local charities throughout the year, with the winner representing Port Lincoln at various 2019 events. This year’s festival will also be boosted by the arrival of cruise ship Golden Princess, which will dock in Port Lincoln with 2600 passengers and 1100 crew on Sunday. “Tunarama is a unique celebration of the seafood industry,” Humenick says. “It has progressed and evolved over the years – once upon a time it was more like a carnival but now it is more of a mixed festival and we also use it as an opportunity to showcase our local seafood, wines, craft beer and produce from across the Eyre Peninsula. “Without tuna – which was the first industry here, followed by the prawn fishery and the others that have come on – we wouldn’t have a town. The Tunarama Festival will officially open this Thursday, but the competitions and main festivities will begin on Friday, culminating in a fireworks display on Sunday night.